Hi everyone! I’m back to share another card today. 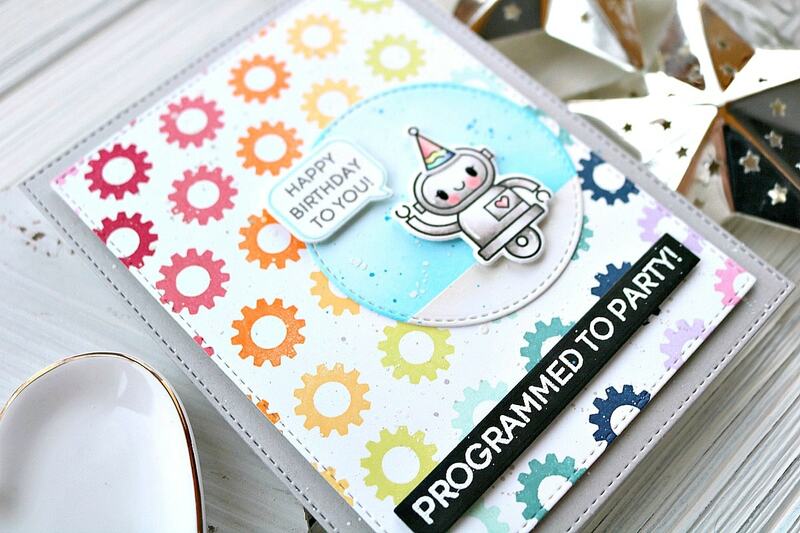 This time I’m showing a card I made for Spellbinders using their brand new Just Add Color collection by Stephanie Low. There are tons of beautiful red rubber stamps in this release, and it was so fun to play with them! It’s not often I use red rubber anymore, but each time I do I’m reminded of how amazing they stamp. Let’s get to my card! I created a simple, yet lovely card using the Floral Love stamp set. This stamp was so beautiful I knew I wanted to heat emboss it and watercolor it…so that’s just what I did! Using my Misti stamping tool I stamped the image once and water colored it in. Then I stamped it once more over top of the dried painted image with VersaMark and heat embossed gold embossing powder over top. I just love the way it turned out. So much so that I decided to leave the front blank and only add a sentiment to the inside of the card. Of course I had to add splatters and some more loose water coloring around the heat embossed image though! 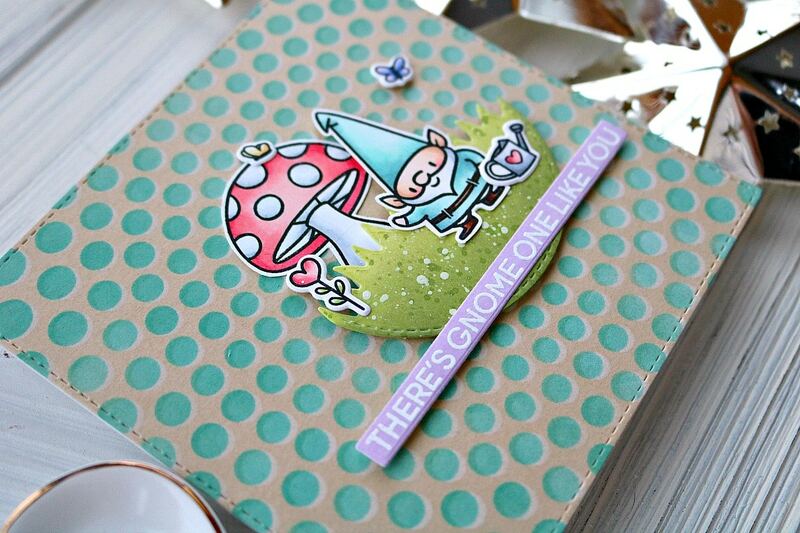 I hope you enjoyed the card I made using the new Just Add Color collection from Spellbinders. Be sure to check out the rest of the release, as it is beautiful! Thank you so much for stopping by today! I hope you’re having a great day, and I’ll see you again soon with another card! Hi, everyone! I hope you are all having a great Wednesday. I’m back today to share a card that I made for My Favorite Things’ newest challenge! I’m beyond excited to be joining them as a guest for the month of March for their weekly challenges. Today’s sketch challenge is a simple, but so sweet one. Take a look. I love balloons on birthday cards, but I didn’t really have any stamps or dies that were big enough to work with the sketch. So instead I used a ton of little images to make the shape I needed! I started by tracing a cup very lightly in pencil on a piece of A2 size white card stock. Then, I took images from the Birthday Chicks stamp set and stamped as many as I could, using my mini Misti, inside the circle. Next, I started grabbing all the itty bitty images I could find and started arranging them inside the circle and stamping them as well. I used Puppy Kisses, Beast Friends, Bitty Bears, and Frightfully Sweet. Once I had fit as many images inside as possible, I stamped the present from Bitty Bears as my balloon tail. I colored all of the shapes in with my Copic markers, trying to make all the same shapes the same colors to stick to one color scheme. To fill in the balloon shape, and really give it definition, I used my Copic markers in BV00, BV01 and BV02 to add dots within the circle. I focused on making them denser around the outline, which helped with creating the shape. Once I was done with the dots, I erased my pencil outline. Using my ink blending tools and Some Shaded Lilac and Spun Sugar Distress Oxide ink, I ink blended the outer edges, fading the color towards the balloon. This really helped highlight the balloon shape and added some beautiful color to the card. I splattered some watered down white paint over the ink blended portion, protecting the balloon with my hand. My sentiment was from the Yay For You stamp set. I heat embossed it onto some vellum paper, and trimmed down to be strip. I used my scissors to cut the cute banner end. At first, I had a white piece of paper with the heat embossed sentiment, but I didn’t like that it covered up so much of the balloon’s images, so I switched to vellum. This way you can see more of the fun details! I cut teeny tiny strips of foam tape and adhered them behind the letters on the strip. Then I added that to the card with my T-square ruler. To finish the card I drew in a balloon string, added cute white gel pen details and Glossy accents to some of the images, and adhered the card panel to a card base! That’s it for my first sketch challenge for MFT. I hope you enjoyed my take on the sketch! Be sure to head over to their blog to see all the great inspiration, and I’ll see you again soon with another card! Hi, everyone and welcome back! 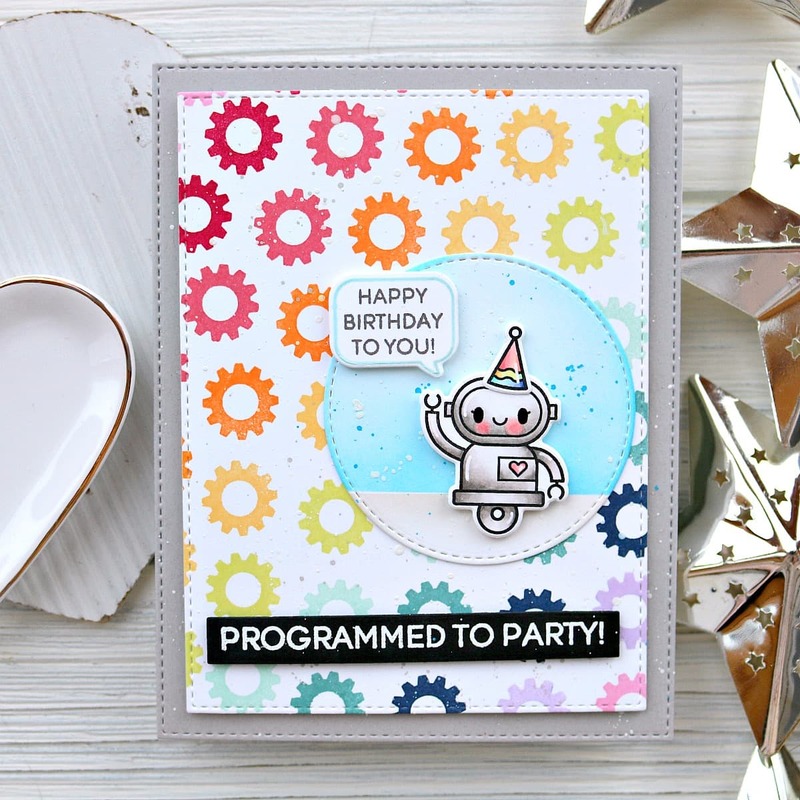 I’m sharing a fun card for Heffy Doodle today using some of their newest release products. I’ve been loving switching it up from winter cards lately and making some springy type cards! Today’s card really could be for any time of year, but those cute butterflies and grassy scene have me thinking of spring! I started the card by die cutting a square from the Stitched Squares dies, and doing some stenciling over it. I used the Circles of Life Stencil for this! I went over it once with white pigment ink, and then shifted the stencil and went over it again with a aqua color. I made sure to let the white ink dry before adding the second layer. I love the detail this adds! Once my background was done I went on to work on the scene of the card. I stamped out a bunch of the images from the Gnome Matter What stamp set and colored them in with my Copic markers. I die cut them out, as well as a small circle from the Stitched Circles dies. I also used the Grassy Lass Border dies to create a little grass patch. I ink blended some green inks over this piece, and did a lot of splattering of the darker green as well as some white paint to give it some interest. Next I arranged all of these elements on my card, centering them where the stencil naturally was centered. I didn’t make this right in the center of the card, but instead off to the right side. 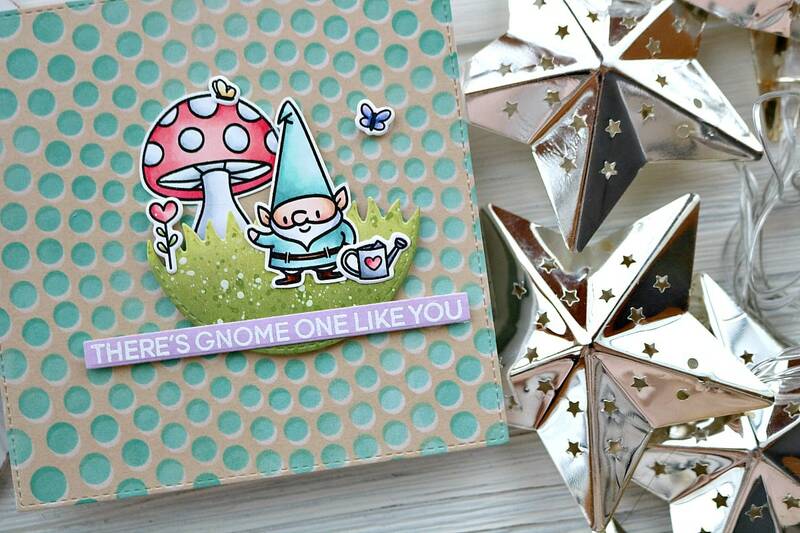 I also heat embossed a sentiment from the Gnome Matter What stamp set and die cut it with the Strips of Ease die set. This was attached to the card with some foam tape, and my card was complete! I hope you enjoyed this project for today! Are you making the transition to more springy cards too? Let me know! Thanks so much for stopping by today, and I’ll see you again soon with another card! Craftin Desert Divas February Release Peek! Hi, everybody! I’m super excited to share a card today for the February release from Craftin’ Desert Divas! This new release is all kinds of cuteness and has lots of adorable Spring time products. 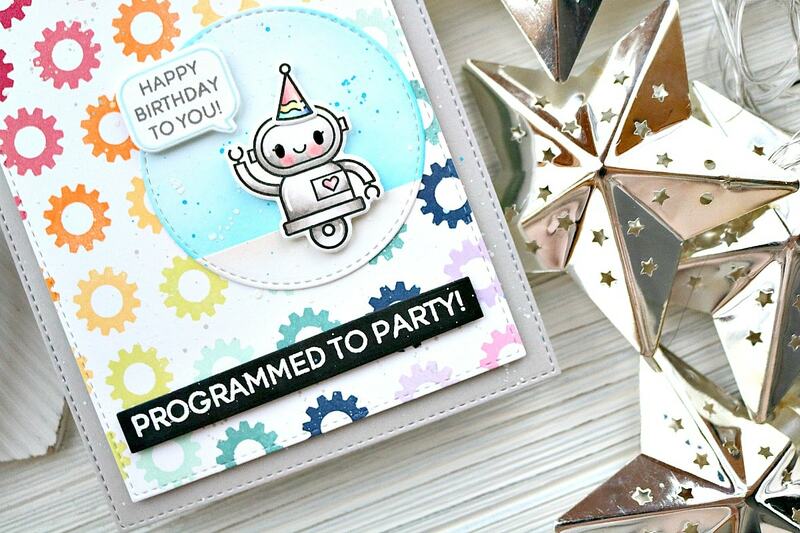 Here’s a look at my card featuring today’s featured stamp set! I saw fellow DT member Saundra do a stencil embossing technique that I just had to try. I used the heart stencil to create the same effect, and ink blended Abandoned Coral and Tattered Rose Distress Oxide over it. I also splattered some pearlized water over the panel to add some shimmer. I added a grassy die cut for the sweet lamb to stand on and a heat embossed sentiment. The rest of the images in this set are just as sweet as this one! Be sure to check out Craftin Desert Divas for more sneak peeks of this awesome set, and I will see you again soon with another card! I created this card by doing some stenciling on kraft cardstock to gets some dreamy white lines using the Heffy Doodle stencil Barber Shop stencil. Then I stamped and colored some of the cuties from the Lawn Fawn stamp set Love You a Latte. Adding all of these elements along with a blue stitched heart to a card base completed this card! I think this is a great non traditional valentine, but could also be used for so many occasions! For my next card I went really simple and stamped out some images from the Let’s Roll stamp set by Lawn Fawn. I trimmed them out and put them on a simple background that I had die cut with the Starburst Trio die from Your Next Stamp. I used Honey Bee’s alpha stamp set to create my own sentiment for this card. And that’s it for day 5 & 6 of the Valentine’s Day series! I hope you enjoyed these cards for today. I can’t believe that Valentine’s Day is on Thursday! I’m really not ready. Hope you all have a great day, and I’ll see you again soon with another card! Hi, all! 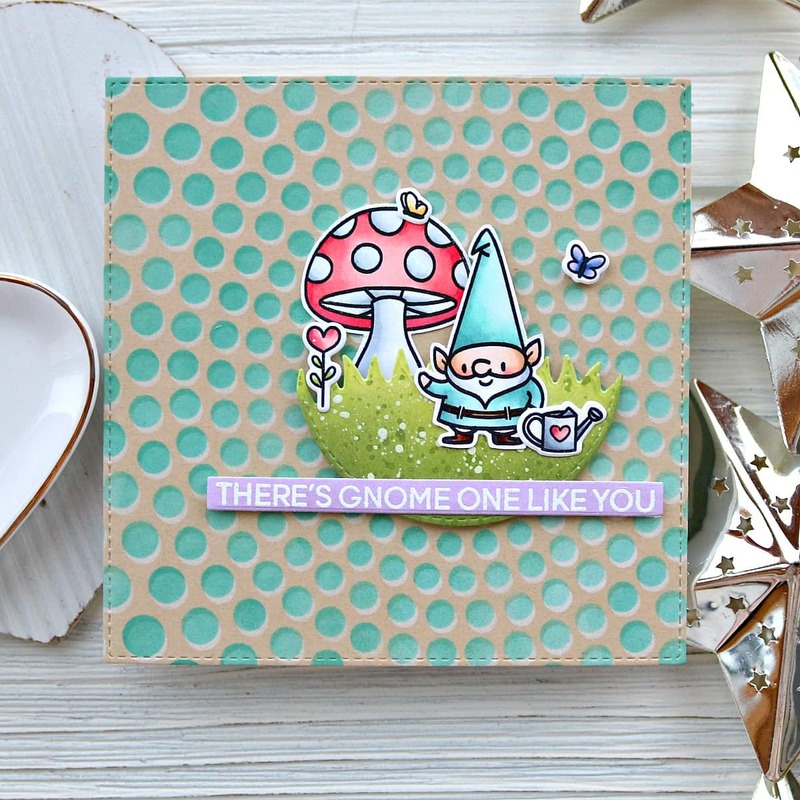 Today I am sharing this card I made for the new Heffy Doodle release! I love the new Bots of Love stamp set. It’s got so many fun images and some really sweet sentiments. Let’s jump right in! Today I decided to make a birthday card using the set along with some other Heffy Doodle products. I started by die cutting two stitched rectangles from the Stitched Imperial Rectangle dies in different sizes, one from gray card stock and the other from some white card stock. On the smaller, white rectangle I used one of the gears to stamp out a pattern with some rainbow inks. I used all Catherine Pooler inks for this, going through the rainbow. Luckily it worked out perfectly and I got through all the colors!